This Cody Kite is crafted to the exacting standards of European master kite builder Lutz Treczoks. Made of the finest materials, this amazing kite that will stand proudly at the top of any kite collection. This classic kite performs best in medium to higher winds. Especially suitable to hauling up all kinds of line laundry as a result of the strong lift it develops. Every serious kite filer needs at least one Cody Kite in their collection and the Treczoks Cody is one of the finest examples you will ever find. Samuel Franklin Cody was an early aviation pioneer. Though his Cody design is a winged variation of Lawrence Hargrave’s Double Box designs, Cody liked to tell of how his first inspiration for kite was a Chinese cook who taught Cody to fly kites. 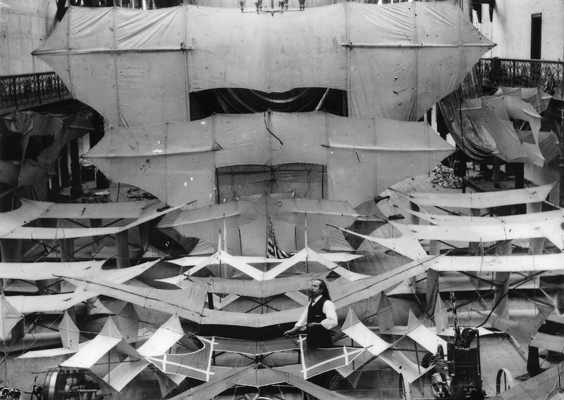 Though Samuel Cody ultimately died in an 1913 when test flying his latest airplane design broke apart at 500 feet, kite fliers have long recognized the Cody kite for its contributions to early aviation and as a kite that will stand the test of time. When you fly a Cody your not just flying a kite, your are flying a piece of avaition history. Here is Samuel Cody with his kite collection... about 100 years ago. I own a lot of different kites. Finally have a Cody! The Cody kite is a kite for serious fliers. By your fourth flight, the kite will be easy to assemble. Practice helps. In a fresh wind, it pulls like a truck, but is a steady kite. You will need gloves. You will need to figure out your ground stake scheme before launching. The Treczock Cody is art, history and well constructed treat for the modern flier. Click the button below to add the Treczoks Cody Kite by HQ to your wish list.